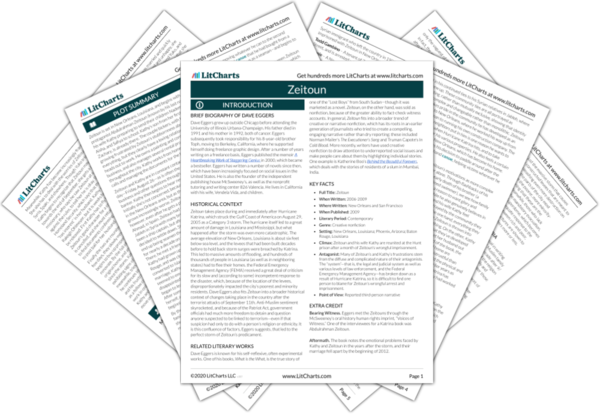 Instant downloads of all 942 LitChart PDFs (including Zeitoun). 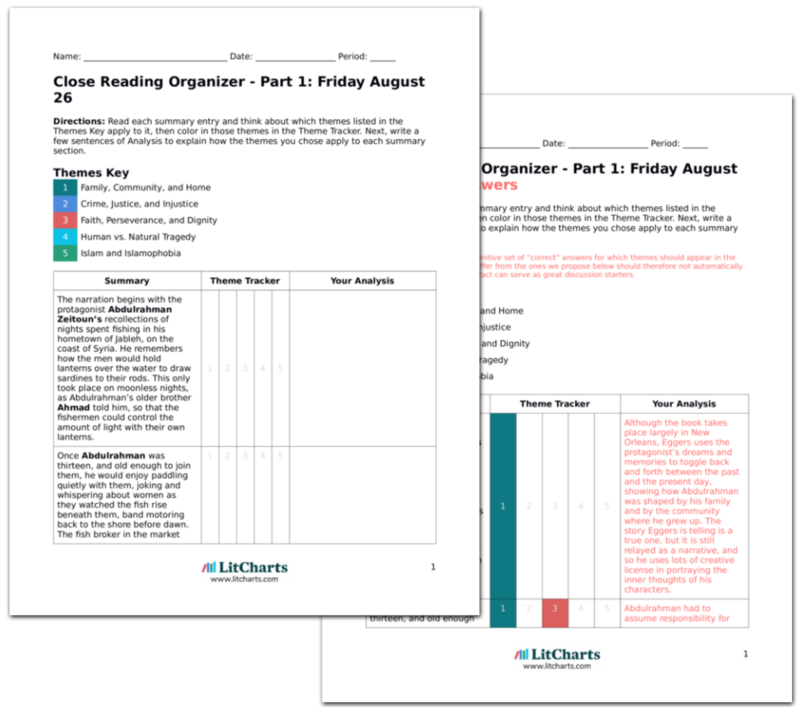 LitCharts assigns a color and icon to each theme in Zeitoun, which you can use to track the themes throughout the work. In the morning a new guard arrives, and seems similarly convinced of the men’s guilt. But Zeitoun grows more optimistic as the day goes on, assuming that the city will stabilize and order will be restored. As soon as he can call Kathy, she’ll find a lawyer and sort everything out. Like Kathy, Zeitoun clings to the hope that Katrina can’t have entirely done away with the existing system of law and order, and that it will only be a matter of time before the regular pathways of justice reemerge. Breakfast includes ham slices, so Zeitoun and Nasser can’t eat much again. Zeitoun begins to examine the new wire and portable toilets of the chainlink structure. It must have taken a great deal of manpower to move and construct this so recently after the storm. Within a day of the storm officials must have already been making plans for this makeshift prison. At the same time, he knew, thousands of residents were stranded in the city. Again, the guards appear uninterested in or even actively disapproving of Zeitoun’s and Nasser’s religious beliefs and practices. Zeitoun, of course, is also a successful contractor and builder, so he is well situated to understand just how many resources it must have taken to build the prison—rather than using these resource for rescue efforts. Around midday, buses arrive at the station, bringing about thirty prisoners from the Jefferson Parish and Kenner jails—they had been in prison before the storm. With their orange uniforms, the similarity to Guantánamo Bay is even more striking. Guantánamo Bay is terrifying to Zeitoun because many of its prisoners remain there for years without being charged for a crime, in a kind of legal limbo. Ham sandwiches are served again for lunch, so again Zeitoun and Nasser do not eat. The presence of dogs is a constant, often barking threateningly at some prisoner. One prisoner mentions Abu Ghraib and the infamous photos of torture, wondering if it’ll happen to them. Nasser can’t believe the guards really think they’re terrorists, but Todd rolls his eyes. The four of them are alone in a cell while everyone else is crammed together—they’re clearly thought to be important prisoners. The dire conditions of imprisonment are exacerbated for Zeitoun and Nasser given that they’re growing weaker every day, without access to proper nourishment. The lack of legal structure and the guards’ perverse enjoyment of harsh practice seems to recall a situation of prisoners of war more than anything else. 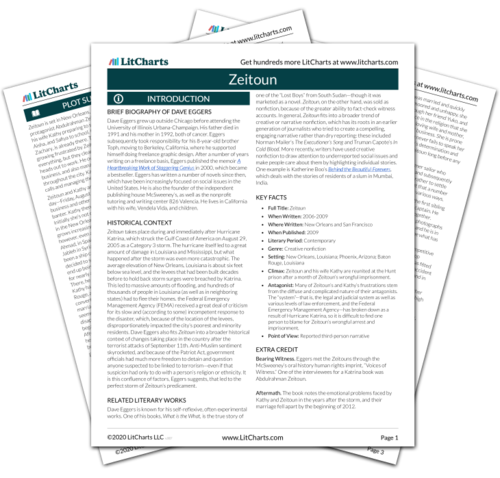 Get the entire Zeitoun LitChart as a printable PDF. In the afternoon, one guard gives a cigarette to a prisoner in the cage next to Zeitoun’s, and then returns to the station and reappears with a television crew from Spain, who conducts an interview. When the reporter approaches Zeitoun with the microphone, the guard yells not to speak to that one. Todd marvels that the prisoner has been bribed, but Zeitoun has a glimmer of hope that the footage might reach his brother in Málaga. It’s difficult for him to want his family to see him like this, though, being mistreated and gawked at in a cage—the greatest shame he’s ever been subjected to. Access to the media is granted, but remains extremely limited, suggesting that freedom of the press is another right done away with at this makeshift prison—especially, it appears, when those suspected of terrorist-related activity are concerned. Still, Zeitoun knows just how committed his brother Ahmad will be to keeping in touch and trying to ascertain where Zeitoun could be, so this might bring them one step closer. He had hoped his siblings would see him in the proud position of helping others, but now he is almost afraid of them seeing him in such an undignified state. Later that day a white middle-aged prisoner is brought into the cage with Zeitoun and the others. He looks clean and put together, unlike many of those who had stayed during the storm. He is friendly and gregarious. He introduces himself as Jerry, and tells them that he’s in prison for siphoning gas from a neighbor’s car when his was found, undamaged but out of gas. It was an honest misunderstanding, he says, but Zeitoun wonders why he’s so cheerful, and why he’s been put in their cage, rather than in one of the empty ones. Zeitoun was quick to realize what the “evidence” of his and the others’ possessions would mean for the authorities. Here, too, he’s able to get inside the heads of his accusers by beginning to suspect that they’ve placed a mole in the cell with the prisoners, hoping to gain the kind of information that could condemn them and serve as a real reason to be charged. Jerry asks the four others how they’ve gotten here. Then he starts to ask more pointed questions to Zeitoun and Nasser, questions which don’t flow from the conversation. He talks disparagingly about the U.S. and about George W. Bush, and about the competence of the U.S. military and the wisdom of U.S. foreign policy. Though Todd responds, Zeitoun and Nasser remain quiet: Zeitoun is suspicious about Jerry’s intentions. Jerry seems to be making questions and asking comments meant to provoke a similarly derisive, negative response about the American military and foreign policy. Knowing that anything they say could be used against them, especially as Middle Easterners, Nasser and Zeitoun are wary. Suddenly, a young prisoner in his mid-twenties starts chanting, his knees drawn to his chest, “Be nice to your mom!” The others in his cage are annoyed, but the man is clearly disabled in some way. He seems to be in a kind of trance state. Then he starts pacing the cage, which the guards have forbidden. The guard yells at him to stop moving, but the man doesn’t realize he’s being addressed, and then touches the fence—making the guard enraged. The guard gets a colleague and they open the cage with something that looks like a fire extinguisher. They tie his feet with plastic handcuffs and then spray him head to toe with what Todd says is pepper stray, as the man screams like a child. Another guard dumps a bucket of water on the man and leaves him screaming and moaning on the pavement, before dragging him back to the cage. This anecdote is a shocking example of the breakdown of justice within the makeshift legal infrastructure at the bus station prison. The man involved is obviously mentally unwell, and should clearly be in a hospital setting or at home, rather than in a prison, much less one with as few resources to deal with mental illness as this one. The guards’ response to the man’s behavior seems not only thoughtless but sadistic, using much more violence than is needed and seeming unconcerned about the pain and harm being done to the man. People are essentially being treated like animals here—cages and all. Tonight there are more prisoners, more agitation, and soon the pepper spray comes out again. Zeitoun is reminded of seeing elephants in a Lebanese circus pass through Jableh as a boy: the trainers would prod or punish the animals with large steel hooks. These guards are used to maximum-security prisoners, and now they’re using their harsh tactics on a totally different kind of animal: prisoners only guilty of curfew violations or trespassing. Here, Zeitoun’s past gives him not consoling memories but a sobering comparison between the circus’s treatment of animals and the guards’ treatment of human beings. Zeitoun proposes one possible reason for this, which is that the guards are overreacting to a largely nonexistent threat. Zeitoun feels enormously guilty: he knows Kathy was right, and he should have left when she told him to. He could endure anything if he could only call her. Zeitoun can’t imagine why he’s not allowed a phone call—it seems purely punitive, a combination of opportunity, cruelty, and ambivalence, just like the pepper-spraying of the disabled man. After brushing off Kathy’s concern for so long, Zeitoun knows that she must be frantic with worry. This feeling of guilt is collapsed into a feeling of anger and blame towards the guards whose treatment of the prisoners seems irrationally harsh. Exhausted and angry, Zeitoun now begins to have wild, tenuous thoughts of escape. He wonders if something awful could happen to him here. He thinks of the disabled man throughout the night, knowing that he normally would have leapt to such a man’s defense, but here he couldn’t. He feels that such actions diminish the humanity of all of them. Zeitoun is used to thinking rationally, planning ahead, and persevering through various challenges. This is the first time that his thinking starts to take wilder paths, showing just how desperate he feels at the prison. His thoughts on the indignity of the situation encapsulate the point Eggers seems to be making. Baena, Victoria. "Zeitoun Part 4: Wednesday September 7." LitCharts. LitCharts LLC, 27 Jan 2016. Web. 18 Apr 2019. Baena, Victoria. "Zeitoun Part 4: Wednesday September 7." LitCharts LLC, January 27, 2016. Retrieved April 18, 2019. https://www.litcharts.com/lit/zeitoun/part-4-wednesday-september-7.